This is a house of a couple who works as a traditional medicine doctor in Sancheong. 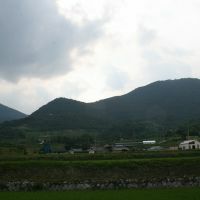 The site is surrounded by mountains and paddy fields in a little village. 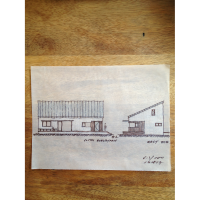 The client wanted to live a simple life in nature, so we decided to design a small house. On the first floor I planned two rooms and one of them can be the extension of the living room with sliding door for family gathering. Using the slope of the roof planned an attic room which can be used as a study and vedio room. From the living room you can see the beautiful scenery of the area and enjoy the sunset of the day on the terrace. Now the family became three with a little baby and finally this house became a happy home of them.